SANTA CLARA, CA--(Marketwire - Sep 10, 2012) - Inphi Corporation (NYSE: IPHI), a leading provider of high-speed, mixed signal semiconductor solutions for the communications and computing markets, today announced impressive benchmark results for load-reduced dual-inline memory modules (LRDIMMs) featuring Inphi's Isolation Memory Buffer (iMB™) technology. The 32GB LRDIMM modules from Samsung Electronics, enabled by Inphi's industry-leading iMB, doubled server capacity and boosted performance by up to 275%. Conducted by Principled Technologies, a leading independent technology benchmark service with decades of testing experience, the benchmarking environment included an IBM® System x3750 M4 server based on Intel® Xeon ® processor E5-4600. IBM x3750 M4 supports up to 1.5TB of LRDIMM memory operating at 1333 MT/s and 1.35V. The system was configured with the IBM x3750 M4 running multiple virtual machines on VMware® vSphere® 5 and each instance running Microsoft® Windows Server® 2008 R2 containing 50GB of Microsoft SQL Server® 2012 database. The benchmark emulated an e-commerce workload and measured "orders per minute." The x3750 M4 was first configured with 384GB of standard Registered DIMMs, or RDIMMs, to determine overall application performance. The server's RDIMMs were then replaced by iMB-enabled Samsung LRDIMMs, doubling capacity to 768GB of system memory in the very same slots as the RDIMMs. The system configuration with 12 VMs and 768GB system memory, using 32GB Samsung LRDIMMs, processed 275% more orders per minute as compared with the system configured with 384GB of standard memory. "These benchmark results validate LRDIMMs in general and, in particular, what we at Inphi are committed to achieving with our iMB technology," said Paul Washkewicz, vice president of marketing for Inphi's Computing and Storage products. 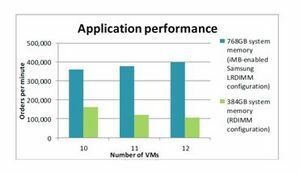 "LRDIMM buffers with our iMB technology were able to double capacity and dramatically and boost performance on one of the most advanced server platforms available today. This reflects how systems of all kinds can take advantage of iMB-enabled LRDIMM technology to expand and enhance the performance in the cloud, data centers and multiple other enterprise applications." "iMB-enabled Samsung LRDIMMs can provide higher application productivity, increased energy efficiency, and a lower real estate footprint by maximizing a company's existing server infrastructure." "For any company that needs to gain memory without losing space, iMB-enabled Samsung LRDIMMs with Samsung memory and Inphi's iMB technology could be a wise investment." Unlike RDIMMS that limit the amount of server memory that can be installed due to their loading profile, LRDIMMs replace the register with a memory buffer to reduce the load. This enables servers' memory to be easily scaled upward, with more and higher-density DRAMs on each module, so that both capacity and speed are boosted while using the same motherboard real estate as an RDIMM. For a copy of a white paper detailing the full testing and evaluation of iMB-enabled Samsung LRDIMMs, go to http://www.inphi.com/images/pdfs/lrdimm_performance_0812.pdf. Inphi Corporation is a leading provider of high-speed, mixed signal semiconductor solutions for the communications and computing markets. Inphi's end-to-end data transport platform delivers high signal integrity at leading-edge data speeds, addressing performance and bandwidth bottlenecks in networks, from fiber to memory. Inphi's solutions minimize latency in computing environments and enable the rollout of next-generation communications infrastructure. Inphi's solutions provide a vital interface between analog signals and digital information in high-performance systems, such as telecommunications transport systems, enterprise networking equipment, enterprise and data center servers, and storage platforms. To learn more about Inphi, visit www.inphi.com.